One neighbor on the block told a CIM team member, "I looked out my window and I thought, Well, I guess someone bought the lot next door!" Story by Elizabeth Grams. Photos by Laura Brummer, Joe Bulger and Jeanette Duddy. 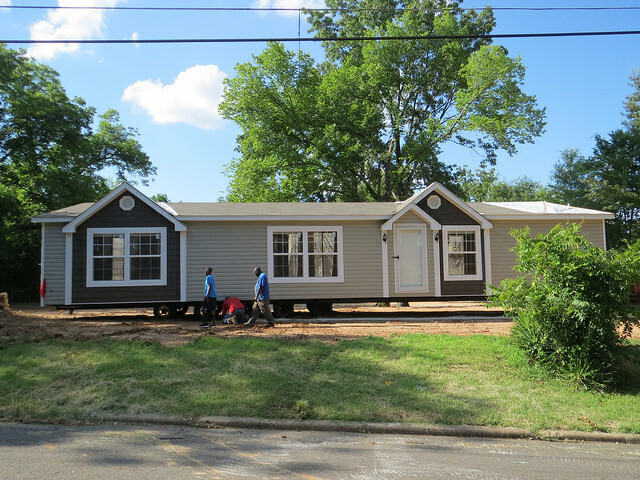 Two new modular houses rolled into the Allendale neighborhood on June 11 and 13. 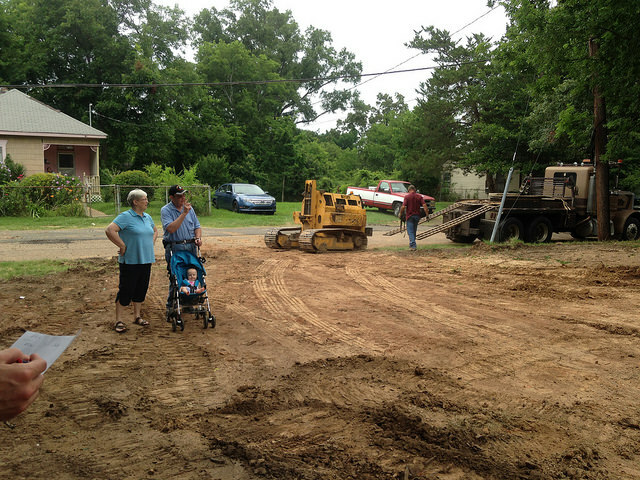 Christians in Mission members cheered as their future homes arrived at 1934 Dove Street and at 1935 Jordan Street. The houses face two different streets but share a backyard. They are two blocks away from the Yale Avenue location where other community households live. 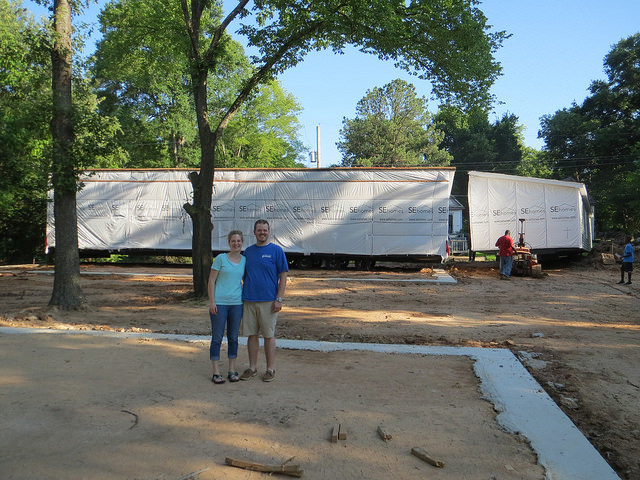 After wiring and plumbing are finished, John and Colleen Bowar will live at 1934 Dove, which they are renting from another People of Praise couple. Ben and Kathleen Reinhardt, currently living at 1434 Yale, will move into 1935 Jordan. 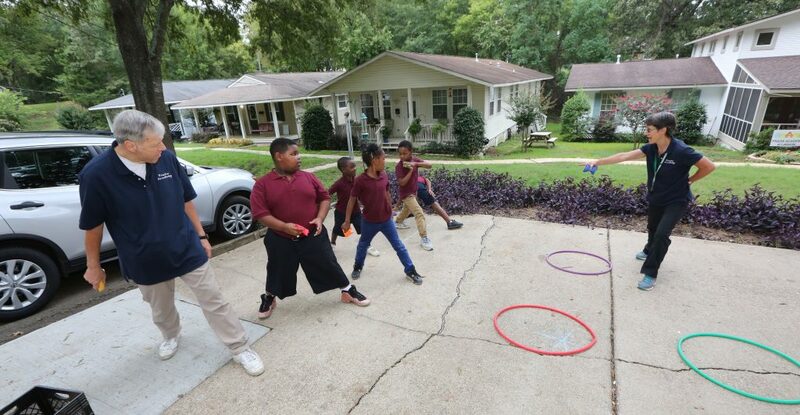 That will leave the Yale property available for the start of the community’s new school, Praise Academy at Lakeside, which begins classes at that location on August 11. 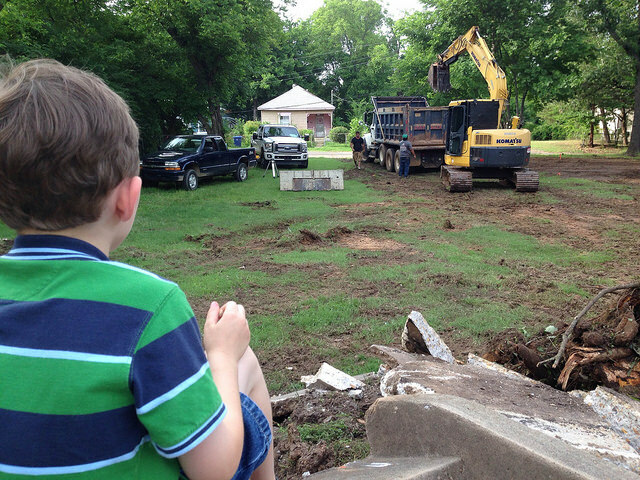 Paul Barrett surveys the preparation for the house foundations on Dove and Jordan Streets, just a short walk from his family’s home on Yale Ave.
Plans were complicated by a recent Shreveport law that prohibited modular housing within the city limits without special permission. In fact, last November the city zoning board had denied permission to several petitioners applying for zoning variances for similar types of modular housing. John and Colleen Bowar in front of their new home, 1934 Dove St. Both houses arrived on trailers in two sections and were placed on concrete foundations laid a few days earlier. The sight of two halves of a house rolling along the hilly Allendale streets drew Christians in Mission team members and other curious Allendale neighbors out of their homes. Patti Deakin, Pat Malone and Marianne Duddy watch the new houses coming in. The new houses are very close together: “Close enough to toss a tomato from one house to the other,” says Colleen. Wonderful to see all the exciting things happening in Allendale! Praise God. May the Lord's work there continue to grow! Glory to God. Our work in Lakeside just took another step forward. I'm also looking forward to hearing reports on our "Praise Academy at Lakeside" as it begins in August. PRAISE GOD!! Looking forward to hearing the fruit of our presence deeper in the hood. Praise God to hear and see the work of the power of the Holy Spirit even to have an unanimous board vote! Thank you committed brothers and sisters in Allendale! This is all SO great! The Lord just keeps on moving into the neighborhood, to paraphrase The Message's paraphrase! May God bless you all and all the ministry going on down there. Praying for you. Those are good looking homes! It's fun to imagine the life that will happen around and them, not to mention the new school! May God continue to bless the work you're doing in Allendale. All - exciting news. I look forward to hearing how God uses these households to lift His banner of love ever higher. What an exciting event! Love seeing the pictures. I hope Paul gets to learn the names of a whole new set of vehicles! You are the hope of our nation! God bless you!! Glory Glory Glory to Our God! Glory to God for His marvelous works! All here praying for Academy!